Today I wanted to talk about hair removal. A few years ago I did a blog post on the Philips Lumea Hair Removal System and I talked about how it changed my life. I used to have the worst time removing hair because of my uber sensitive skin. It literally used to bleed if I shaved, and waxing only half worked because my roots were so strong the hair would break instead of coming out. Nothing ever worked to satisfaction and my skin looked AWFUL. I never wore anything that showed my legs because of all the little dots (girls you know what I'm talking about right?!). Anyways when I started getting laser hair removal and I'm talking over 10 years ago, it was a game changer for me. I was so amazed by it I got most of my body done. Over the years I must have spent a fortune, and even though in my mind it was totally worth it, I knew that I couldn't and shouldn't be spending that much forever. My hair got lesser and lesser and I only needed touch ups now and then. My life had gotten busier with work etc and I just didn't have the time to keep making appointments. So the Philips Lumea was truly a game changer. I was able to do touchups as and when I needed in the comfort of my own house. To this day I still use it on my face maybe once a month because pesky facial hair refuses to go away completely thanks to all our hormones. However as amazing as it was, there were certain areas on the body which were just a no go for me. Why? It was way too painful! I'm talking about the underarms and the bikini area. If anyone has ever had a bikini or Brazilian wax, multiply the pain by 5 and that's how it was for me. So I just left those areas because I couldn't tolerate the pain. 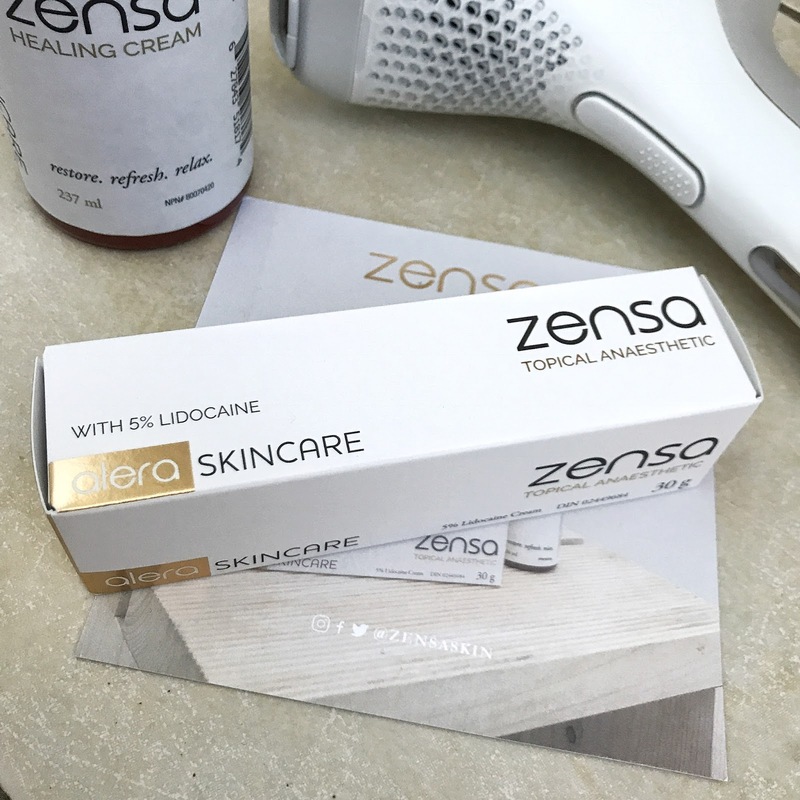 However, a few weeks ago I was introduced to an amazing cream called Zensa which is a topical anaesthetic and it is made specifically for skin treatments like laser hair removal, any kind of peel, waxing, or even getting a tattoo! I have been using it and its made such a difference to what level of pain I can handle. I am able to get through the treatment without jumping out of my chair everytime in shock. It really helps numb the area so its a much nicer experience. And the good thing is its available over the counter, without a prescription at all Shoppers Drugmarts across Canada. I've only had to use a small amount each time so a little bit goes a long way. It's definitely a useful little thing to have around in your beauty supply kit! If you guys any other questions about laser hair removal, ask away because I can't swear by it enough! I have been cursed with excessive body hair! removing them is such a chore. I will definitely be trying the tips and tricks you mentioned. I was not happy with shaving and waxing to remove unwanted hair, then I consider the laser hair removal option. I like to visit Laser Hair Removal Vancouver Clinic, they offer the most exceptional innovation to effectively decrease hair with almost no inconvenience. Everyone can visit the clinic for laser hair removal. t ordinarily takes a few treatments to give help from unwanted hair. Intermittent upkeep treatments may be required also. I see, you got sensitive skin, finding a suitable ladies hair remover / treatment product will be challenging as it involved testing and monitoring on the skin reaction. glad that you found the suitable product now, keep us posted on your progress. appreciate it!